When you think of pop-star families, you normally think about the Jackson-5 or the Osmonds of the '70s, or even modern-day groups such as Hanson. But in 1956 when rock 'n roll first started to make inroads on the record charts, one of the first sibling groups appeared. I'm talking about the one-hit-wonder sister duo of "Patience and Prudence". It's funny how the internet can answer even the most trivial little questions you have. A few weeks ago, I was channel surfing and came across an old favorite from the '70s - Steve Martin's comedy movie, "The Jerk". During one (semi) serious scene, Steve Martin and Bernadette Peters sing a night-time duet on the beach. The song in question is a little ditty called, "Tonight You Belong To Me" (and NO, it is not the Paul Stanley song on his KISS solo album by the same name!). The song sounded nostalgic, like a 1920's classic, in which Martin played Ukulele and Peters accompanied on flugelhorn. Well, at the end of the movie I watched the credits for the song writer and then did a quick search on the internet. Turns out I was right, as "Tonight You Belong To Me" (words & Music by Billy Rose & Lee David) as performed by Gene Austin first hit the charts in the 1927. But, then came the surprise: it was also a top 5 hit by the one-hit-wonder group, Patience and Prudence in 1956. Yep, they were up there on the charts alongside Elvis Presley! Although their follow-up single charted at #11, their subsequent singles failed to chart and the singing duo quickly disappeared into the "where are they now files". Patience & Prudence were actually sisters and the daughters of orchestra leader Mack McIntyre. 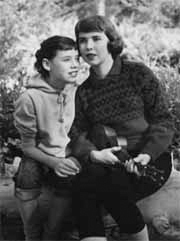 Patience (11 years old) and Prudence (14 years old) McIntyre were encouraged by their father, who was already a well know piano player and songwriter (who also co-wrote the B-sides of their two hits). Mack McIntyre brought his daughters into the Liberty Records recording studios in Los Angeles in the summer of 1956. One of the songs from their audition tape was a cover of the 1927 hit by Gene Austin called, "Tonight You Belong to Me". Liberty Records (also the home of rocker Eddie Cochran) signed "Patience and Prudence" and rushed the tune into distribution. The bouncy song became a hit, charting at #4 in September of 1956 and became Liberty's biggest selling record for two years. Their follow-up single, "Gonna Get Along Without Ya Now" charted at #11 at the end of '56. The B-side, "The Money Tree," also charted. But alas, Patience and Prudence enjoyed no further chart success when six additional singles released between 1957-59 failed to chart. Since the 1950's was basically a 45rpm market, it is no surprise that there was no Patience and Prudence album. Here is a little trivia for you folks- the Patience and Prudence version of "Tonight You Belong To Me" was the #34 song for all of 1956, in addition to placing at #428 among the top 5,000 songs of the rock era (1955-94). So, what happened to the two sisters? On the internet I find nothing about the sisters after 1959. Who knows, maybe they decided that the "music thing" was just a lark and they faded into normal suburban bliss. Their "normal" life in the 1950's after their hit record would obviously be too boring for an installment of VH1's "Behind the Music". Back in the early 90's I saw them on some television talk show that came on one day about 3 pm. The girls looked to be about 44 to 48 years old. If I remember correctly they said Ed Sullivan wanted them to perform on his popular TV talent show. Their dad flatly refused, and the record company and others wanted them to tour. During this TV interview they were asked why they did not continue their singing. They became upset as they said the reason was their dad was very strict and wanted them to get a good education. I think they also said once they were old enough they moved away and would have nothing to do with their dad. I'm not sure if they went to college or not. I recently moved into a house in the West University neighborhood in Tucson, AZ. It is an old brick house, and the landlords told us that Patience & Prudence lived there in the ‘60s. I was doing research to see who they were and found your article. Just wanted to send you an update on them—I haven’t been able to find any other info, but thought you’d be interested to know that they were apparently living in Tucson in the ‘60s! Patience and Prudence branched into the Advertising business. In the late 70's I had the pleasure of working with one of them. Which one escapes me right now. We worked in Chicago at a place called Arthur Meyerhoff and we worked on the Wrigley's chewing gum account. I am not sure where they are now. Prudence married Don Conca from the band 'Love'. Both were junkies. They had a little girl named Paige. At that time they were both on Methadone. I know that Don overdosed and died, back on heroin. I have no idea what became of Pru. We went to Hollywood High together. FYI, Prudence married drummer Don Conka, or at least they were together on and off for decades until his death several years ago. They had one daughter, named Paige. In 1960, I lived in what was then the 'out of state' dormitory, Yavapai Hall, at the University of Arizona in Tucson. It was a small dorm and Patience was a dorm mate. Occasionally, local radio stations would call her but she was very private. I believe she was from Pacific Palisades. She can be seen in the 1961 UofA yearbook on page 291. Many of my friends at the Uof A were from prominent show business families ( i.e. Hoagie Carmichael, Jr. ) and/or prominent families so Patience was just one the group. I lost track of her after the 1st year because I changed schools. Perhaps she is pictured in successive yearbooks. What prompted me to look on the internet was a PBS program featuring 50's & 60's music. Thanks for the information. A ZABA Search revealed a Patience A Mcintyre with an address of North Hollywood, Ca. It showed a dob in 1942. Unknown when this information was posted. They now reside in River Oaks, Wisconsin, much like the two sisters in Whatever Happened to Baby Jane? Patience is an invalid and Prudence pretty much waits on her hand and foot, believing she is to blame for her sister’s misfortune. They have two cats, a goldfish and that’s about it. Oh yeah, I almost forgot, some whacko pays them five hundred dollars each year to sing Tonight You Belong to Me over the phone to him on his birthday. Obviously, he remains their staunchest fan. Other than that, the girls have dropped off the map and pretty much keep to themselves. Hi Just thought you might like to know that their song " With a smile and a ribbon on my hair" is used in the UK to accompany television adverts for the National Lottery. By all accounts it has revived interest in their recording. 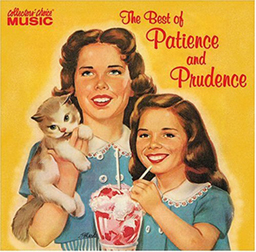 You may already know this, but Patience & Prudence made a track called " A smile and a ribbon" sometime in the 50's. Well The British National Lottery are using it for their advertising. The track and the animated film that goes with it, are getting loads of attention here in the uk. Could even be released as a single!